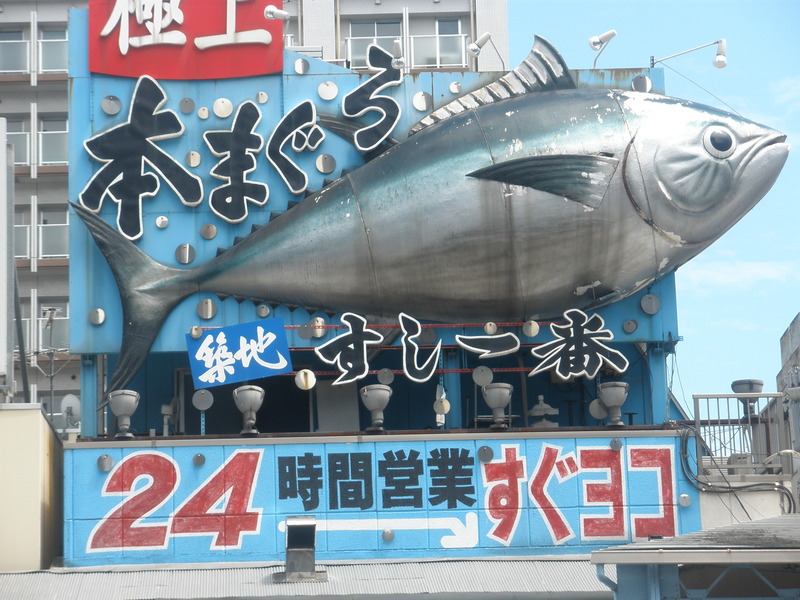 It’s hard to miss the main entrance to the Outer Market in Tsukiji! 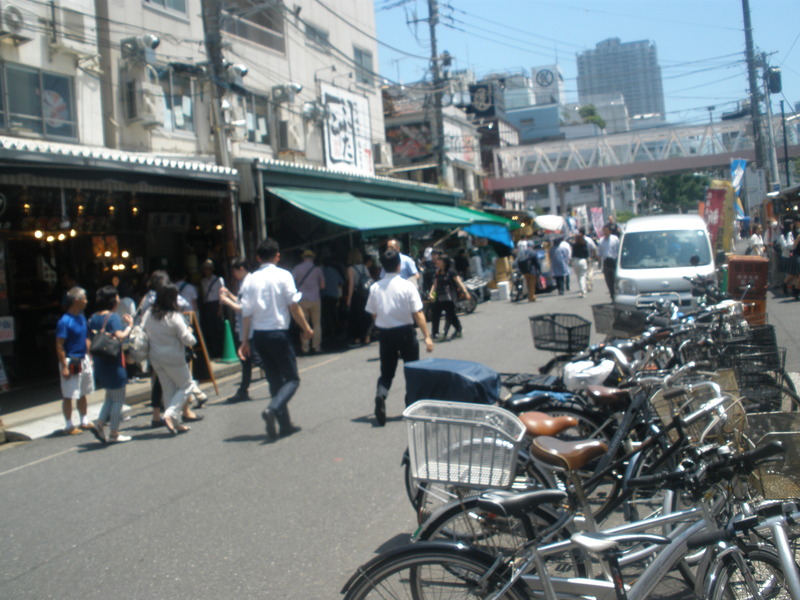 Located in central Tokyo, Tsukiji Market is the largest fish market in the world. It’s so large, it’s actually one of the largest food markets of any kind in the world! The Inner Market is where tons (and tons and tons) of hundreds of varieties of fish and seafood are sold to wholesalers and restaurant owners during the early morning hours. The Outer Market is where the action is if you’re a tourist. It’s here, in the Outer Market, where people from all over the world can sample and purchase a seemingly endless variety of products, from fresh and dried fish to exotic spices to every ready-to-eat food imaginable. My local market sells small, individually sealed, frozen Ahi tuna steaks for a very reasonable price. Ahi tuna (Yellowfin tuna) is high in protein, low in fat, and packed full of B vitamins. While I generally prefer the sustainability and reliably lower mercury levels of small fish such as sardines, the delectable flavor of Ahi tuna is an indulgence I’m not ready to part with entirely. This recipe offers an easy way to enjoy this delicious fish. 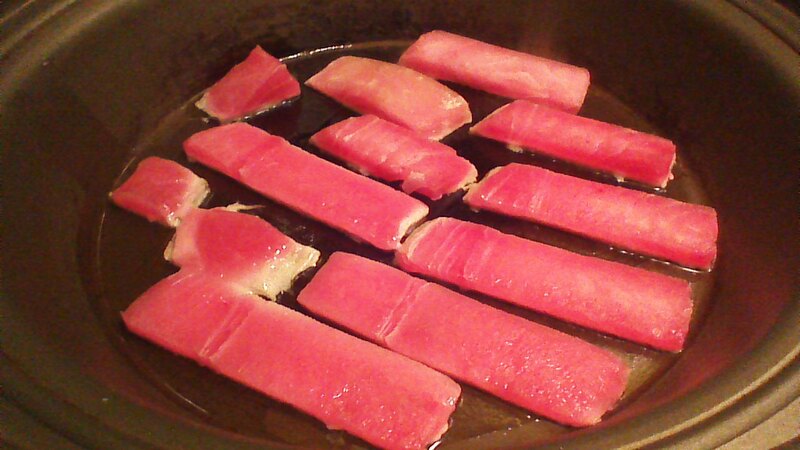 A note about slicing tuna for pan searing: If you enjoy tuna a bit pink in the center, slice your tuna steak 1/3 inch thick and sear quickly. I prefer tuna cooked through, and slice my steak into 1/4 inch thick pieces. It’s up to you. Step 1) Arrange torn lettuce on a serving plate. Sprinkle with cooked, shelled edamame. 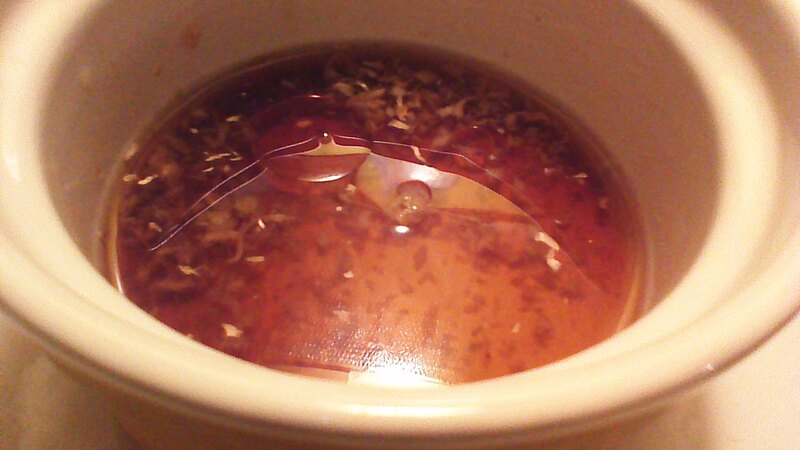 Step 2) In a small bowl, whisk together grated ginger, sesame oil, soy sauce, and chili vinegar to make a simple vinaigrette. Set aside. Step 3) Heat coconut oil in a skillet over medium heat. Make sure bottom of skillet is evenly coated with oil. Add Ahi tuna slices and sear 15 – 30 seconds on each side (if you like the middle pink) or up to 1 minute on each side (if you like the tuna cooked through). 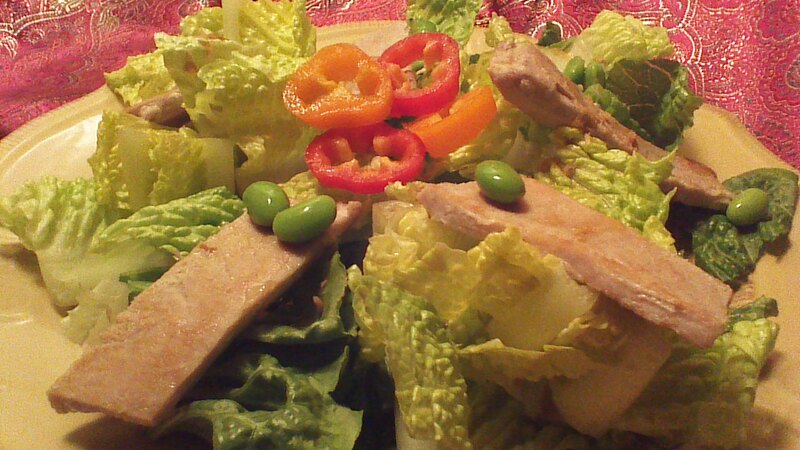 Step 4) Arrange tuna slices over lettuce and edamame. Drizzle with vinaigrette. Garnish with pepper slices. Enjoy your Ahi Tuna Salad! This isn’t your average Tuesday night dinner, friends. This is dinner dressed in its Sunday best! Sockeye salmon is the real deal, with a wallop of heart healthy Omega-3s and flavors induced by the cold, wild waters of Alaska. Sockeye salmon is NOT the same as “Atlantic salmon”, which is code for farmed salmon raised is crowded conditions and often fed artificial colors to turn the flesh pink. No thanks. Instead of grabbing the lower priced Atlantic salmon, I wait. And wait. And wait. Eventually, Sockeye salmon goes on sale – for about the same price as Atlantic salmon. When this happens, I buy several pounds at a time – it freezes well. 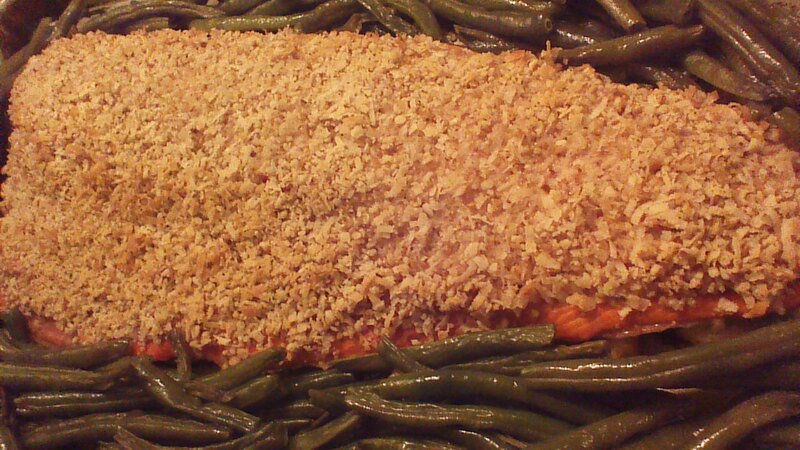 Sockeye salmon is special all by itself, but we’re making it extra fancy today with a crust of coconut and pecans. If you’ve never done this, don’t be intimidated by the idea of a crust. There’s really nothing to it! The preparation is as simple as spooning a crumbly mixture on top of your fish fillet and gently patting it down with your fingers. Seriously – that’s all. Let’s get started! Step 1) Slice lemon or orange into 1/4 inch thick rings, and place rings one inch apart on a baking sheet with shallow sides. Place your salmon fillet, skin side down, on top of the fruit rings. This will prevent your salmon fillet from sticking to the baking sheet. 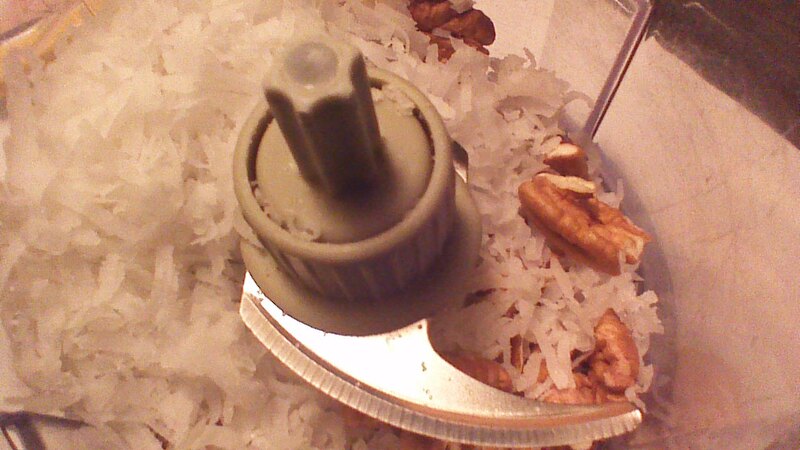 Step 2) Combine pecans, coconut, and salt in a small food processor or blender. Pulse until the mixture has a texture like coarse sand. Don’t get carried away – you want some texture, not a smooth paste. 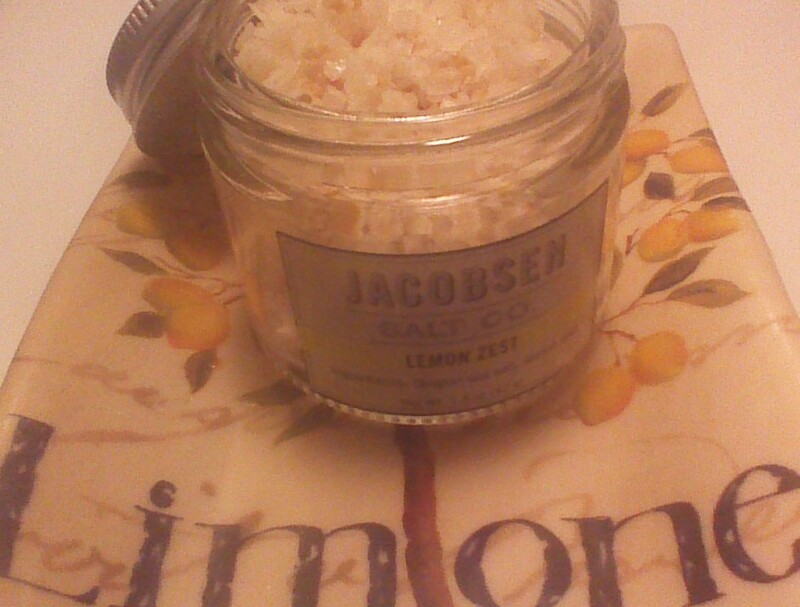 Step 3) Use a teaspoon (nothing larger) to carefully spoon the mixture along the center of your salmon fillet. Try not to let the mixture roll off of the salmon and onto the baking sheet. If that happens, remove as much of the coconut-pecan mixture as you can from the surface of the baking sheet, and place it on top of the salmon where it belongs! Step 4) Using your fingertips, gently spread the coconut-pecan mixture toward the edges of the salmon fillet, creating an even crust over the entire surface of the salmon (it’s OK to leave a very small edge uncoated). Step 5) Carefully place your baking sheet in a preheated 375 degree oven. 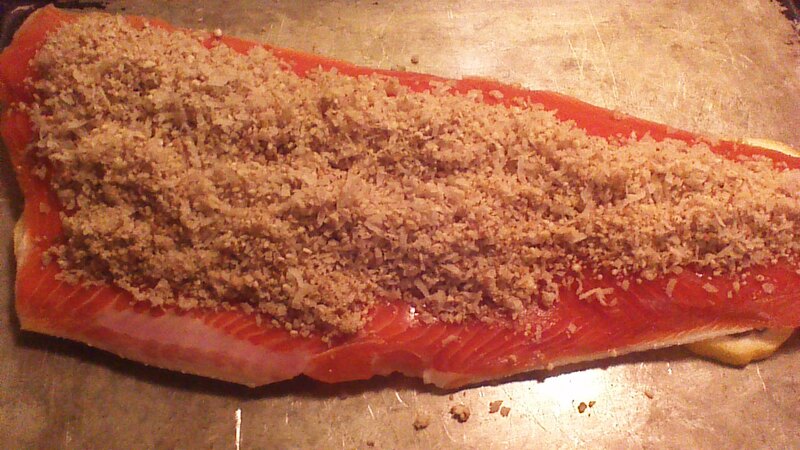 Bake your Coconut Pecan Crusted Salmon for 20 – 30 minutes, or until salmon flakes easily. Step 6) To serve: I like to bring the salmon fillet to the dinner table right on the baking sheet, surrounded with roasted vegetables (roasted green beans are pictured above). It is very easy to cut slices from the salmon fillet to serve your family or dinner guests. Enjoy! Well, that depends upon whom you ask. Some markets label this fish as “steelhead trout,” while others use “steelhead salmon.” The skin of this fish features a faint pink stripe, which by itself would land the fish squarely in the trout camp. Steelhead’s reasonable price is also more reminiscent of trout. 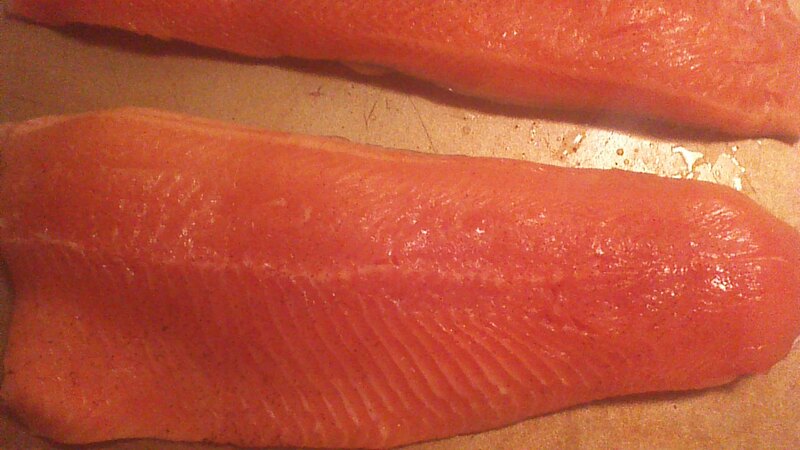 The flesh of this fish, however, is pink and tastes exactly like salmon. Further, the fish actually contains MORE of those heart healthy omega-3 fatty acids than salmon. Call it a trout, or call it a salmon. Either way, it’s delicious. We’re going to use a light hand in preparing this tasty fish – no batter or tartar sauce today. All these wonderful filets need is a light dusting of chili powder and a bit of finishing salt to make the flavor pop! 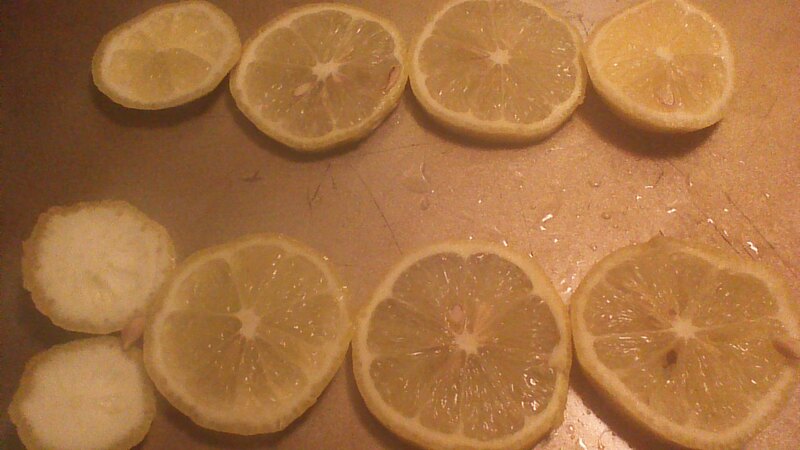 Step 1) Slice the lemon and use it to line your baking pan as shown. Step 2) Lay your steelhead filets skin side down on top of lemon. Dust with chili powder. Step 3) Bake in a preheated 425 degree oven for 12 – 15 minutes, until fish flakes easily. Sprinkle with finishing salt and serve immediately with a fresh green salad. Fish tostadas are a pretty common dinner item here at Crowded Earth Kitchen. My pint size diners call tostada shells “big chips,” and seem to think they are getting away with something sneaky when they enjoy “big chips” for dinner. 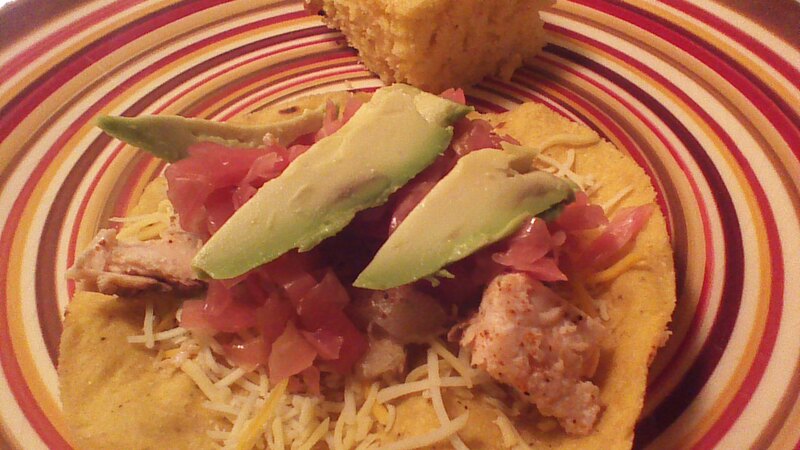 Fish tostadas are a healthy, economical, complete meal. They’re also fast – small filets of tilapia and other whitefish bake in just minutes. Enjoy! Step 1) Lightly grease a baking sheet with coconut oil. Line baking sheet with onion slices. 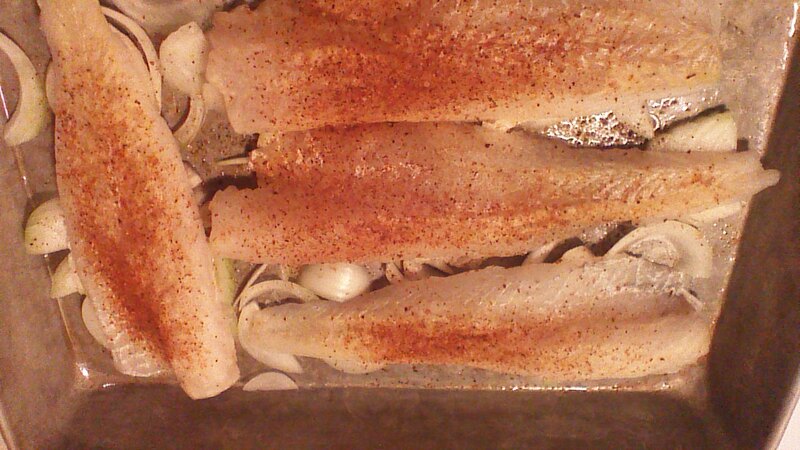 Place fish filets over onion. Squeeze lime juice over fish and sprinkle with chili powder. 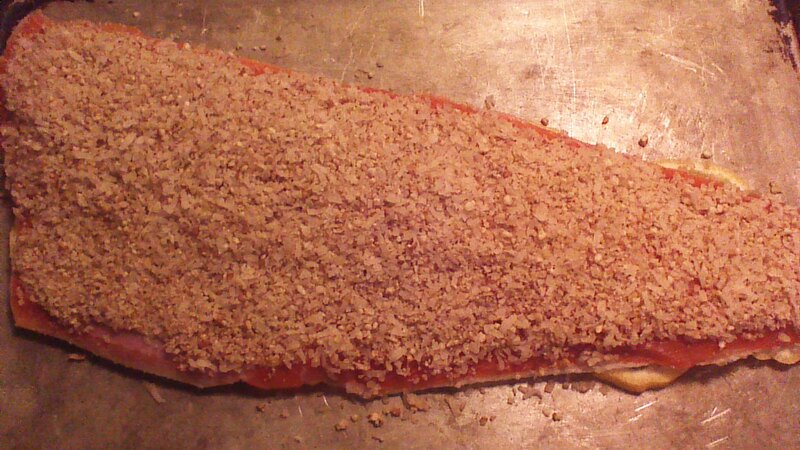 Step 2) Bake fish (uncovered) in a preheated, 400 degree oven for 10 – 15 minutes, until fish flakes easily. Step 3) Flake fish into bite size pieces using two forks. Step 4) Assemble tostadas. If using cheese (not strictly traditional, but tasty), sprinkle cheese on tostada shells first so that it melts underneath the fish. 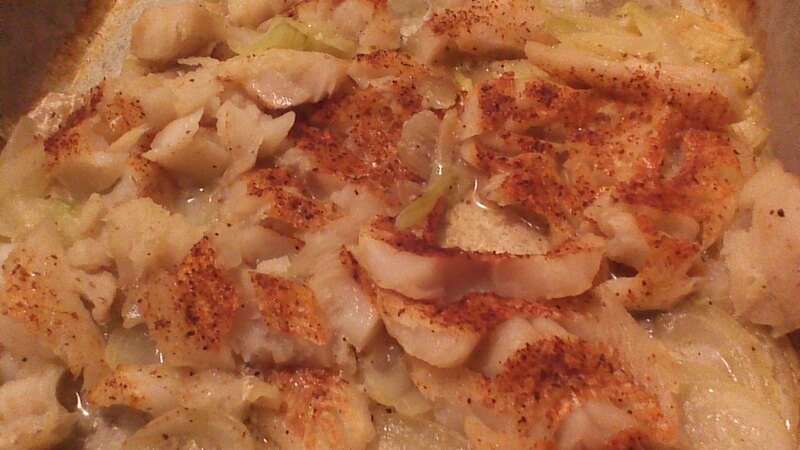 Add fish and onions, then cabbage, then avocado slices. Serve immediately.